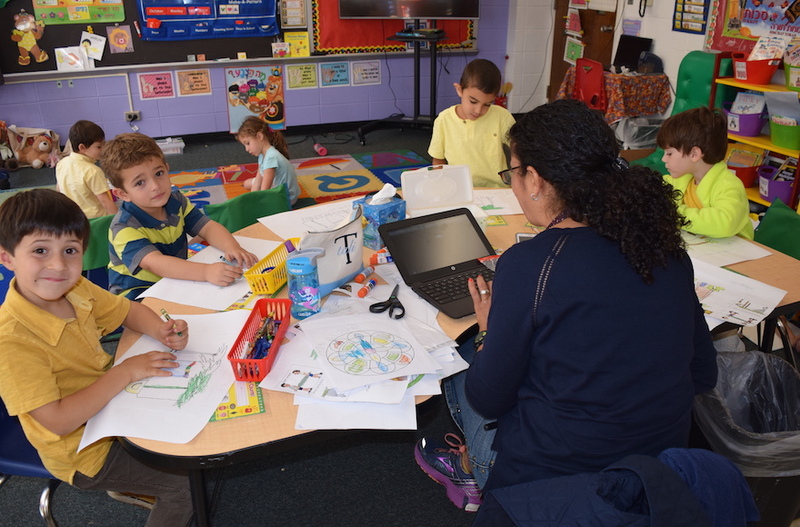 NEW ROCHELLE, N.Y. – In a third-grade classroom at Westchester Torah Academy, 23 students sit in a bright, overheated classroom on a cold, rainy day engaged in a variety of activities. Along one wall, a bunch of 8-year-olds wearing headphones practice math problems on laptop computers. Nearby, a small group sitting at a table works quietly on a teacher-led project related to an upcoming holiday. At another “center,” a few girls read a fiction book together and answer questions about the story to write a book review. After 20 minutes, a tone sounds and each group gets up and rotates to a different center. A teacher flits between them, helping students and answering questions. Later, when the school day is over, the teacher will have a chance to monitor each student’s progress by logging into the adaptive computer programs they use for math, reading and other subjects and checking their performance. Welcome to the “blended learning” classroom. “All programs are interactive and adaptive to the needs of the child, so that the child is presented with materials that are appropriately challenging,” said Nellie Harris, WTA’s early childhood director. Housed in a Reform temple in this leafy New York suburb, the academy opened just five years ago as one of several new Jewish day schools embracing a new model of instruction that uses computer technology to customize student lessons and blends that with small-group teacher instruction. Champions of the approach tout blended learning’s effectiveness for pinpointing each student’s strengths and weaknesses through computer diagnostics, and delivering them tailor-made lessons based on their skill level. Boosters also hail cost efficiencies that they say enable schools to keep down tuition because the data obviates the need to take children out of class to expensive “resource rooms” for enrichment or remediation. At Westchester Torah Academy, an Orthodox school of 148 students from preschool to fifth grade, tuition is below $11,000 – about 50 percent less than at nearby Jewish day schools. Along with WTA, three other Jewish day schools nationwide are using an all-blended model: Yeshivat He’Atid in New Jersey, the Harkham-GAON Academy in Los Angeles and Bader Hillel High School in Milwaukee. But scores of traditional Jewish day schools are also using some degree of blended learning programs, including the Denver Academy of Torah; the Hebrew Academy of Long Beach on Long Island; the Moriah School in Englewood, New Jersey; the Fuchs Mizrachi School in Beachwood, Ohio; and Tarbut V’Torah Community Day School in Irvine, California. Jeff Siegel, who teaches third and fourth grade at WTA, said he worried at first that online learning might mean too much screen time. But experience has allayed those concerns. Siegel’s students spend about an hour each day in front of the computer in three 20-minute increments – far less than the screen time of the average American kid at home. Having worked for three decades in public schools, Siegel said the blended approach allows him to devote his attention to personalized teaching because the computer work takes care of the diagnostics. “It’s less testing, more teaching,” he said. In grades K-4, WTA uses an online math and reading program called iReady, game-based instructional software called ST Math, and a web-based program for Hebrew and Jewish heritage called iTaLAM. When WTA’s Israeli-born principal, Deganit Ronen, who also teaches fifth grade, assigns lessons on the weekly Torah portion, the computerized lesson reflects the Hebrew reading comprehension of each child in the questions it has them tackle. The same goes for math. Older children at WTA use blended learning for problem-based learning in which they present to the class projects that demonstrate essential skills and knowledge. On one recent day, fifth graders doing an American history lesson were going over speeches they had written from a Native American perspective on how they felt about the colonists. They were using the Summit Learning Platform for English and Social Studies and Ulpan-Or for Hebrew and Judaics. Leslie Siskin, a New York University sociologist who has studied blended learning at Jewish day schools for the Avi Chai Foundation — it provides financial support to the day schools experimenting with the approach — said Jewish schools have adapted well to the new method because they lack the big bureaucracies and district structures that impede change at traditional public schools. Even established day schools integrating blended learning more cautiously into their curriculums are moving faster than public and independent private schools, she noted. The 650-student Moriah School in New Jersey is one traditional Jewish day school where blended learning is in heavy use. The bottom line, Alter said, is that blended learning helps students both with learning and self-esteem. Michal Paley, mother of four students from pre-K to fifth grade at WTA, said she has seen the implementation of blended learning at the school evolve over the years as teachers come with different backgrounds and approaches. “My kids love it,” Paley said. “The children are in a warm and loving environment where technology and teachers complement each other. It gives teachers an ability to do more for each child.